Can be scheduled weekly or bi-weekly to suit your needs. 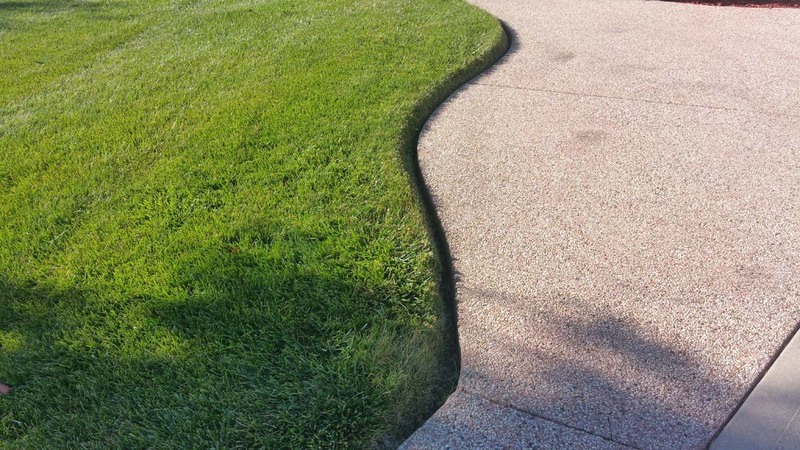 A clean, well defined edge between your grass and path. Keep those pesky weeds OUT of your lawn! 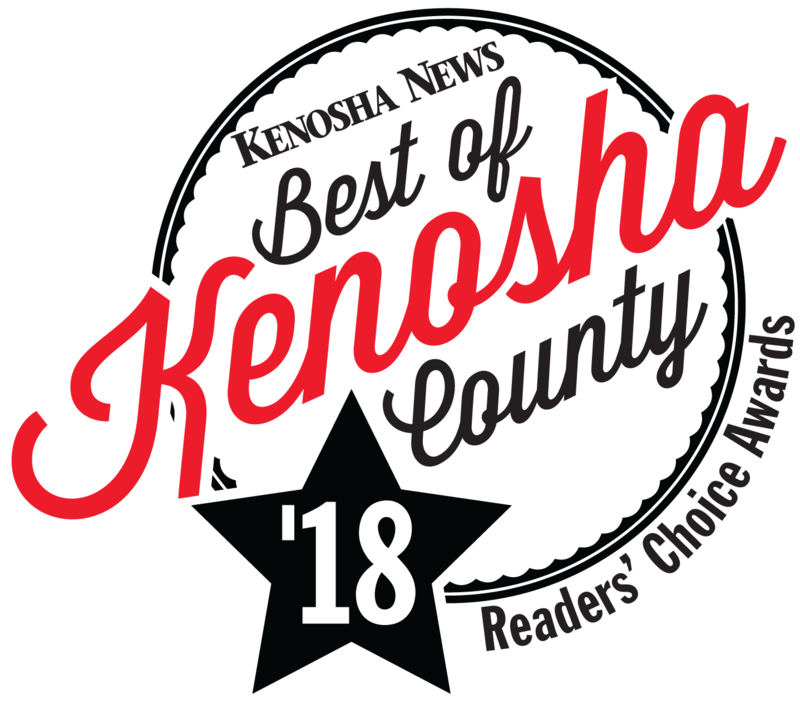 Zach’s Lawn Care offers high quality, competitively priced lawn maintenance in Kenosha and surrounding areas. Weekly or Bi-weekly Mow, Trim, Edge and Blow of your lawn. Monthly treatments optimized for your lawns health. Your lawn will have never looked so full of life. Our weekly or biweekly lawn mowing service includes trimming, edge maintenance and cleanup of clippings with each cut. Nothing looks better than having a clean, well defined edge between your grass and the sidewalk/driveway. 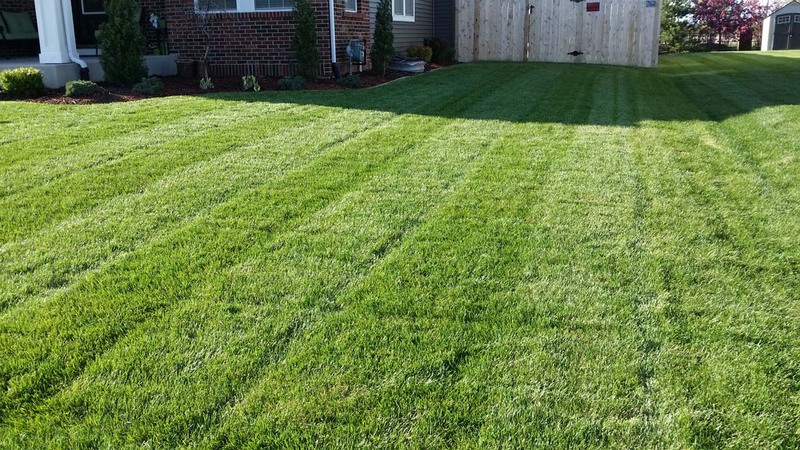 Our lawn treatment program is customized to your lawn giving it the right balance of fertilizer and weed control so that you have a lush green lawn, cut to perfection by us. 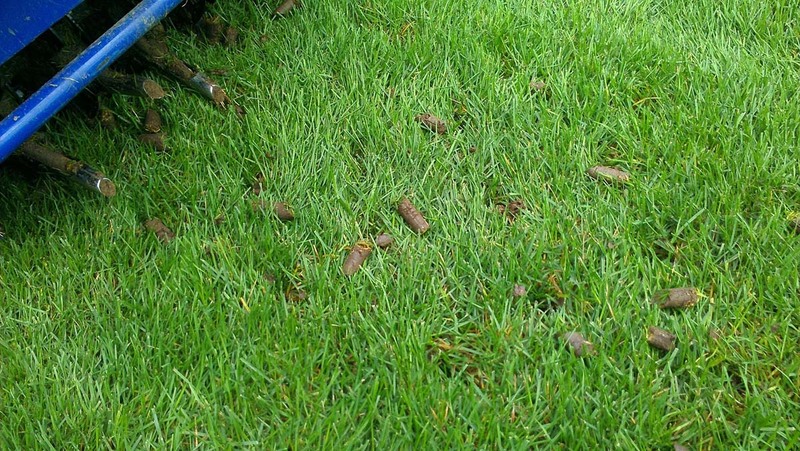 Aeration is an annual necessity in our type of soil. Aeration increases air, water and nutrient movement to the root zone. Core aerating also relieves soil compaction, stimulates growth and intensifies decomposition of thatch. Can be scheduled either spring or fall. 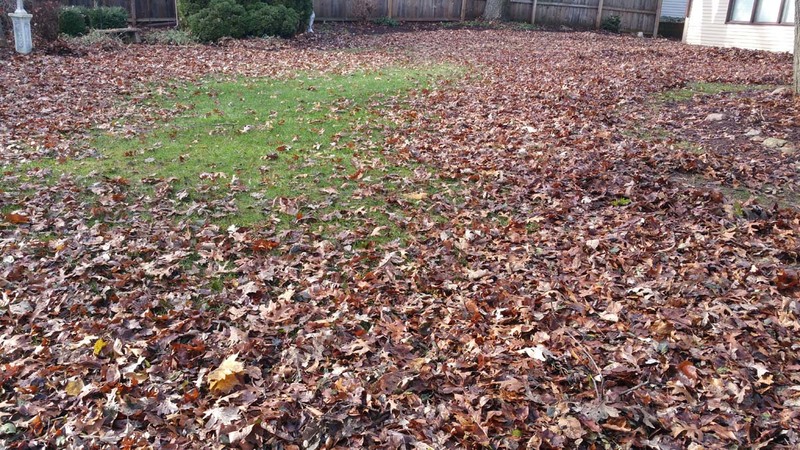 Enjoy your Fall by having ZLC remove leaves, cut back perennials, and clean-out beds before winter hits. Still enjoy raking yourself? Ask about Curbside Leaf Pickup! Is your once-beautiful landscape looking kind of dull? 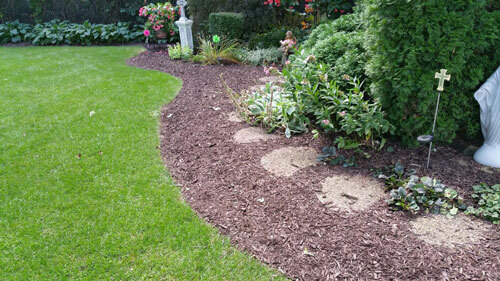 Zach’s Lawn Care can add a refreshing layer of color to your existing bed with a simple top dressing of high-quality mulch. Call for Quote! "I highly recommend Zach's Lawn Care! He is very dependable, professional, and does a great job. My mother is 80 years old and I asked Zach to do the lawn care and snow removal at her home. He has been working with Mom for about a year now and she says she does not know what she would do without him! She loves his kindness, caring, and professional work ethic. Thanks Zach!" "I have used Zach’s Lawn Care for approximately 6 years now. It's hard to find a good honest worker who you can trust. I work a lot of long hours as a law enforcement officer and Zach has really helped me out when I have been unable to keep up with things around the yard. Zach’s Lawn Care is very professional and my yard looks great when he is done. I would recommend his services to anyone!!!" 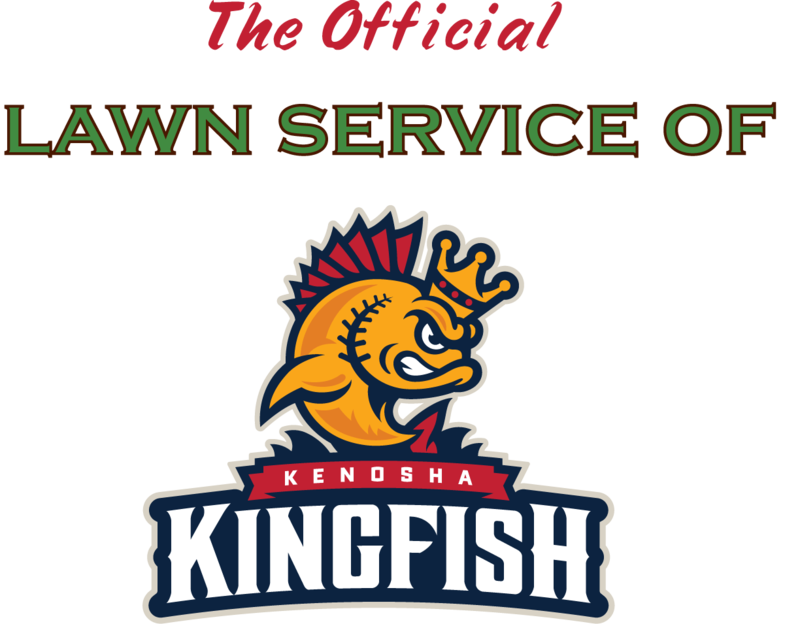 "I have been pleasantly surprised about the services provided by Zach's Lawn care. Always prompt, thorough and always very polite and resourceful. I would definitely recommend his services. You are in for a nice surprise." "Zach did an awesome job on my flower bed...and a great job on major clean up of my parents’ property. Zach is very knowledgeable in his field and made fantastic suggestions on the types of flowers (annual or perennial) and foliage I should use in my yard, based on his expertise. I'll be back next year!!" "I have used Zach’s Lawn Care for 6+ years. He has provided lawn mowing, edging, tree trimming and shrub trimming services. I have always been very happy with the work that has been done. Zach is efficient, on time, and does excellent clean-up when the job is complete. His prices are very reasonable and his work is top-notch. I would highly recommend you give Zach’s Lawn Care a try. You will be happy you did." "Zach provides prompt, efficient, dependable, service summer and winter. Very reasonable rates. I am very lucky to have found Zach." "I have been using Zach's Lawn Care for almost 3 seasons now and the work this young man has been wonderful. My yard is trimmed and looking good. Zach has done a fine job keeping weeds at bay and I appreciate all he does." "My husband and I can’t say enough great things about Zach’s Lawn Care. The service is excellent at a fair price! Our lawn is the envy of the neighbors!" "I have used Zach's Lawn Care for the past year. Zach's quality of care is superior. Zach is respectable, reliable, and dependable. I highly recommend his services." Let us know what services you are interested in and we'd be happy deliver a personalized quote for your property. The guys at Zach's Lawn Care are awesome! I unfortunately can't mow my lawn anymore due to an injury and they came out right away and started taking care of it for me. Fantastic customer service. I highly recommend them! I'm not sure if dealing with Zach's Lawn Care could be any easier. I needed some fall clean up work, so I called and talked to Zach. He asked me a few questions; I snapped some pictures of my yard and the work I wanted done. I received a digital quote the next day, I accepted it and BOOM. I come back from a few days away and everything is done perfectly including a few things that were over and above what I asked for. Looking forward to working with ZLC on all of my yard needs. 10's all around dude! We were very happy with how fast they came out and how beautiful our lawn looked when they were done. We've been using ZLC for 2 years and are absolutely satisfied with their work. They are professional, reliable and do such a great job. We look forward to hiring them for services again next year! Zach's Lawn Care is AMAZING. Our yard has never looked better! They are professional and VERY responsive! I highly recommend Zach's lawn care! Great service and attention to detail. Trustworthy guys that always exceed expectations. I was dealing with a different local lawn care company who kept over-promising and under-delivering. The last straw was when they told me they'd be out to care for my lawn "tomorrow" but, after a week, "tomorrow" never came. They didn't even bother to call me. So, I found Zach online, called him and explained my situation. He said he and his team could provide the services, gave me a very reasonable cost estimate, and promised they would be there within a few days. Guess what? They showed up the very next day AND did an excellent job! I'm a perfectionist with my lawn and was very impressed with the stellar work they did. I'll definitely use only Zach's Lawn Care from now on! Working with Zach's Lawn Care has been a refreshingly positive experience. They epitomize the simple old fashioned hard work ethic done dependably and professionally. Zach is also very accessible and easy to communicate with. I would highly recommend Zach's Lawn Care. Zach and his team are excellent! We use ZLC for our lawn care, annual mulching and edging, and lawn treatments. They are reliable, provide excellent service and the pricing can't be beat! We definitely recommend Zach's Lawn Care. Great job Zach -- keep up the exceptional work! I highly recommend Zach's Lawn Care. They offer a wide range of services, they are very reliable, and payments are a breeze. It's very hard to find honest, dependable service providers these days but Zach's really stands above the rest. Zach will treat you like an individual and not just another address. Zach's = good business. Zach's Lawn Care has been doing our lawn for several years. Quality Lawn, Dependable, Professional, Reliable. He is very knowledgable in the field and has a great resource of local businesses so that if he can't provide a particular service for you, he most likely knows someone who can. Zach and his crew always have a smile on their face and it is clear they love what they do. Our lawn has gone from Blush to Lush! Thanks Zach and crew! !